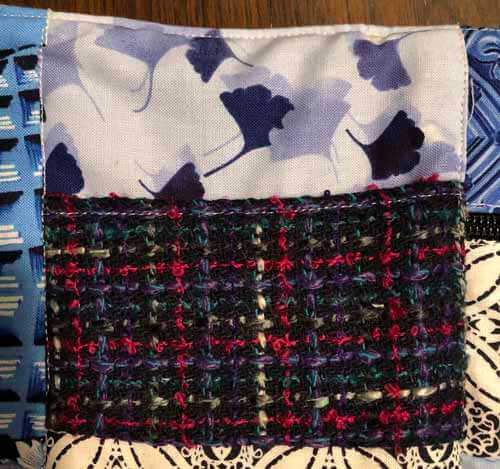 What is a fidget quilt? 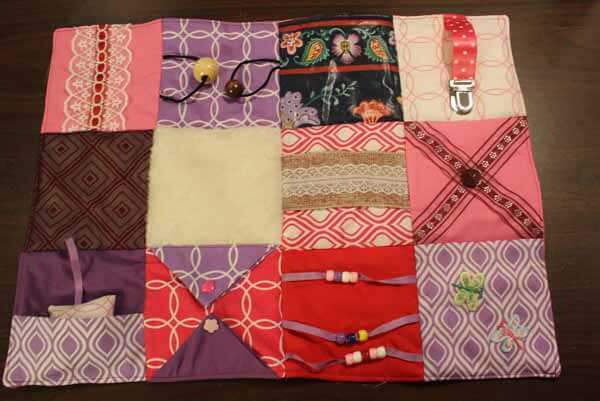 A fidget quilt is a lap quilt which helps provide stimulation for the fidgeting hands of Alzheimer's, dementia, and autistic people. It soothes the fidgeting by entertaining them, busying hands and fingers, stimulates their senses and gives them something to do. 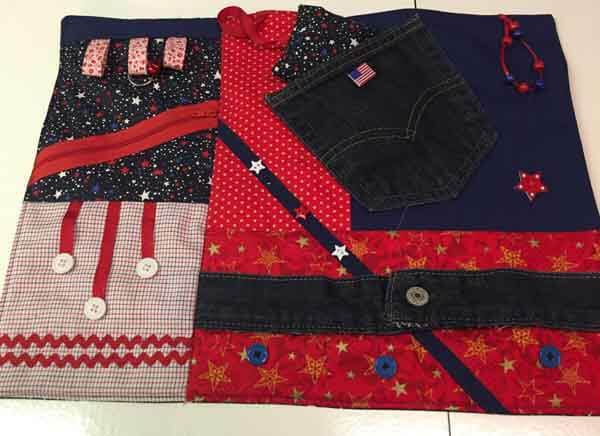 Fidget quilt should be lap size about 18" x 20"
Use different fabric colors and textures - cotton fabric, fake fur, minky, flannel, denim, etc. To learn about fidget quilts and how to embellish fidget quilts, watch this video and read on. 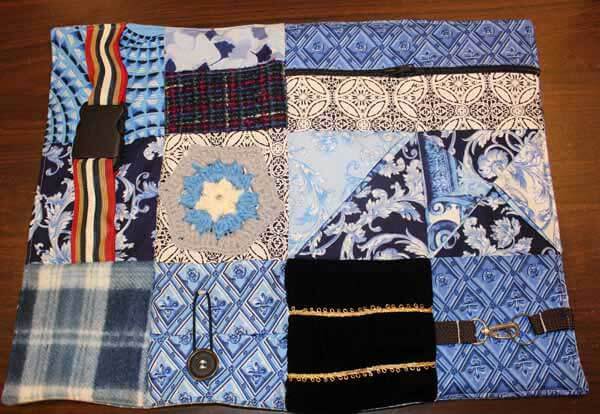 Examples of more fidget quilts are at end of this article. 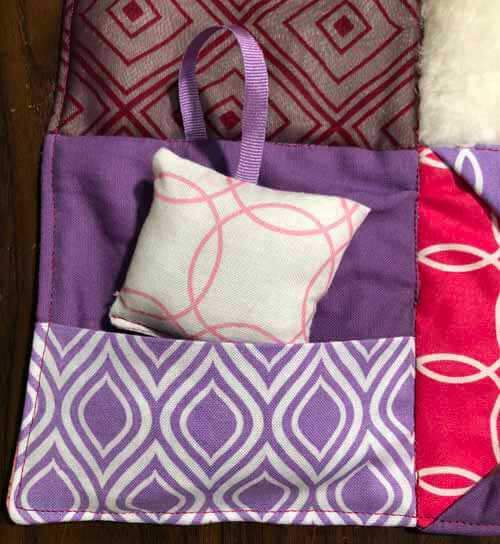 Click to watch the How to Make a Fidget Quilt video in Youtube. 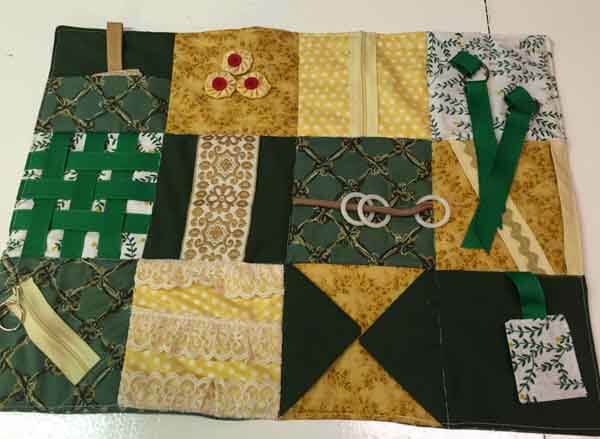 This fidget quilt was made using 5" fabric squares. The squares are a great way to reduce a scrap stash. Or purchased charm packs can be used. Each square is embellished individually and then sewn together. Embellish as few or as many square as wished. Lay the squares on your work surface in a pleasing manner. Embellish the squares as desired. 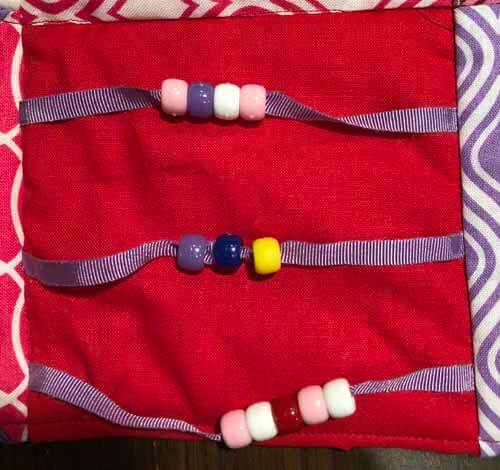 Sew squares together in rows using a 1/4" seam allowance. 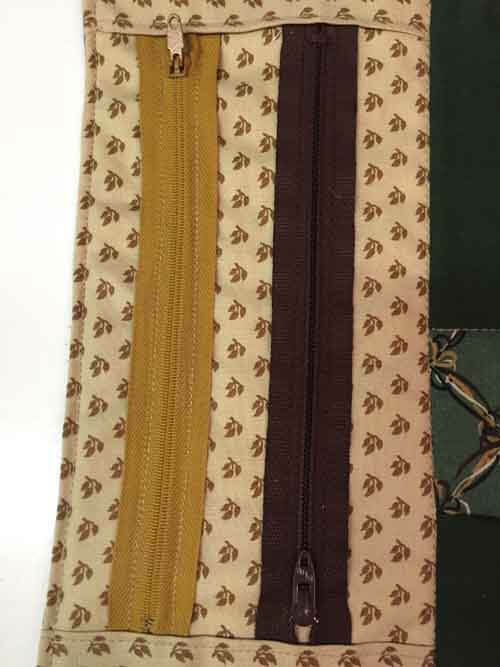 Place top, batting and backing together and finish with traditional binding or pillowcase/envelope finish. 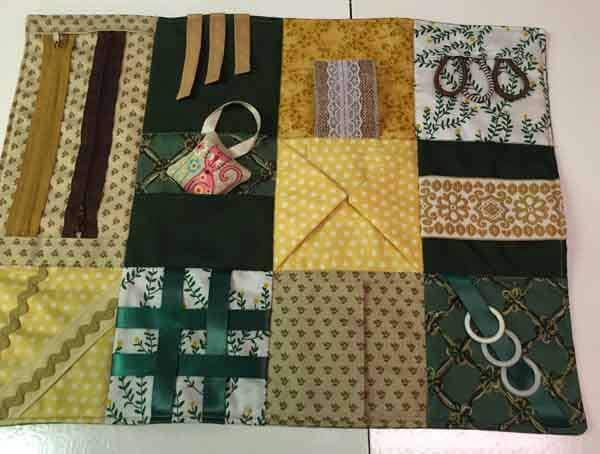 To keep the layers together, either "stitch in the ditch" between squares or tie the fidget quilt. 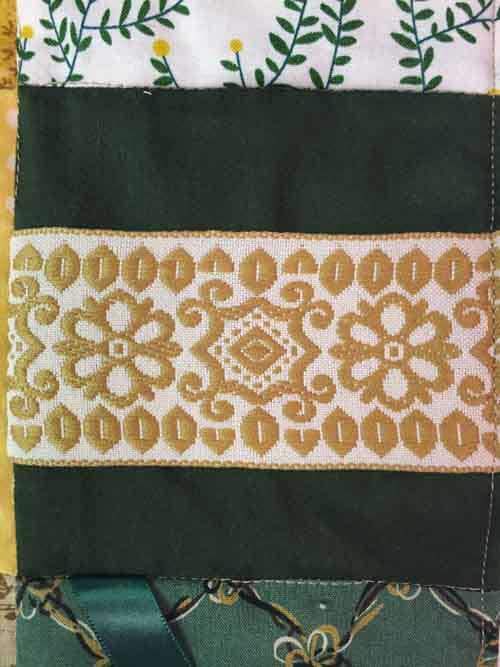 If you need a tutorial on how to machine bind a quilt, our tutorial is here. 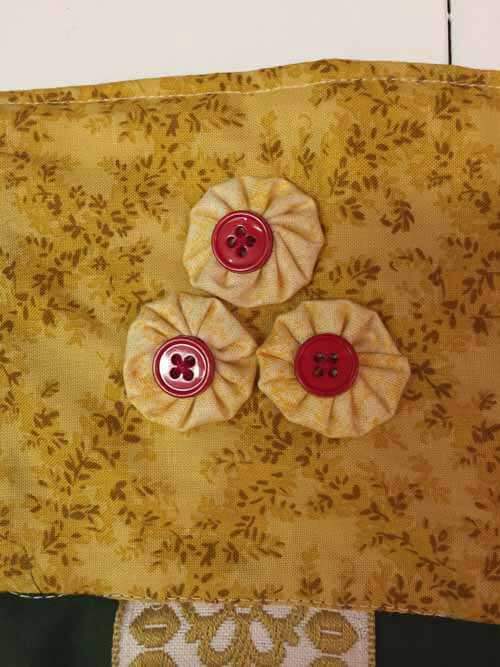 The pillowcase/envelope technique for finishing a fidget quilt is quick and easy. To see our pillowcase/envelope tutorial click here. Woven Ribbon Square: Arrange 2 or more lengths of ribbon along the top edge and two or more lengths of ribbon along the side edge. Weave them. 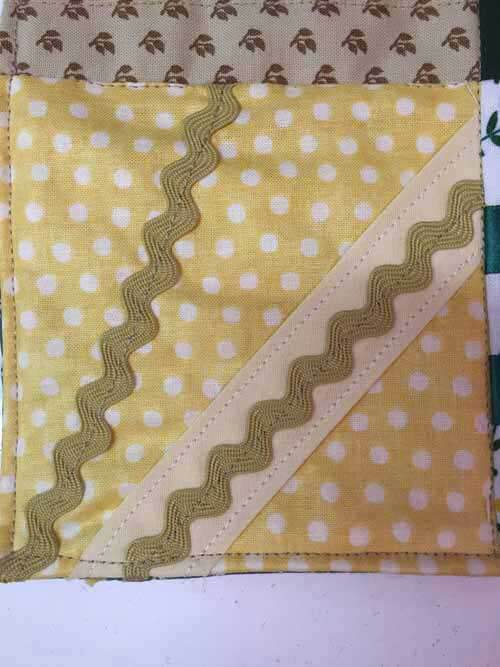 Pin to keep them in place until squares get sewn together. 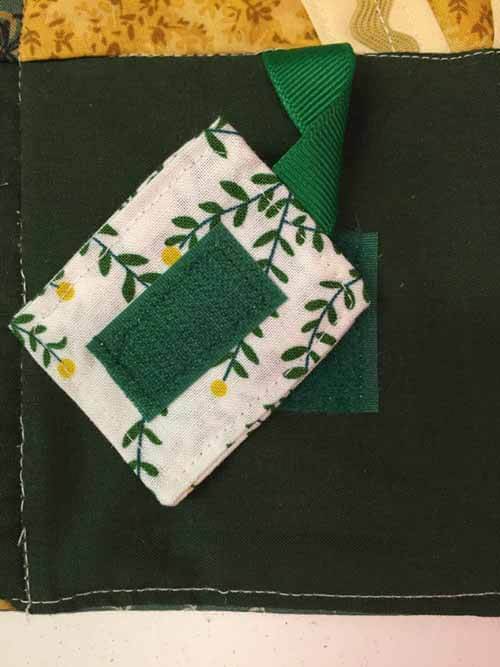 Peek A Boo Square: Sew an interesting applique or item onto the middle of a square. Make two flaps by folding fabric in half (right sides together) and sewing the two short sides. Turn right side out. Make sure the flaps are smaller than the finished square so they do not get caught in top and bottom seams. Sew a piece of Velcro on the flaps to hold them shut. Attach to sides of square. 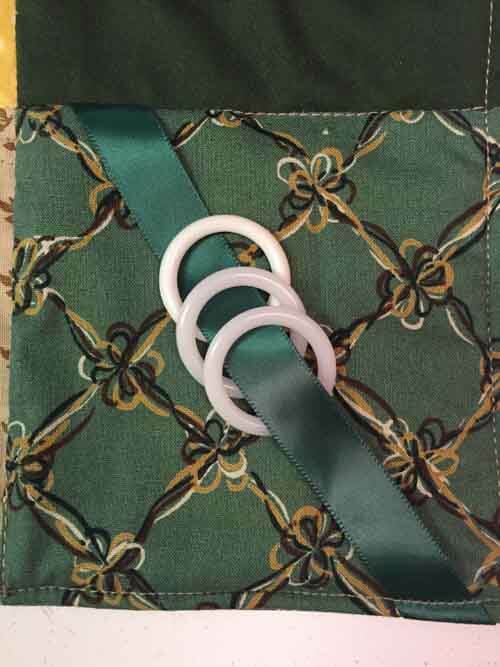 Ring Square: Slide plastic rings onto a piece of ribbon or cord and sew to square in any direction - vertical, horizontal or diagonal. Texture Ribbon or Braid Square: Attach texture ribbon or braid to a square - Sew it completely down or attach only at the sides of the square so fingers can go under the ribbon/braid. Hair Ties Square: To attach hair ties to the square, fold a small piece of 5" wide fabric in half. Place raw edge of this fabric at top of the square. 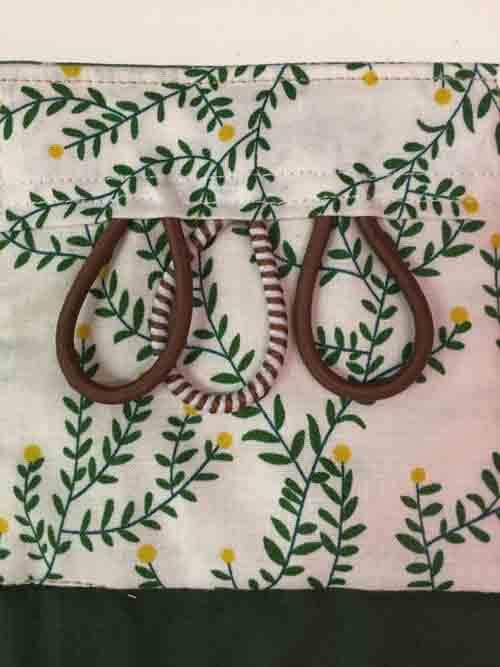 Place hair ties under the fabric and secure in place by topstitching along the fold. If the hair ties have a metal part, cut metal part off before sewing in place. 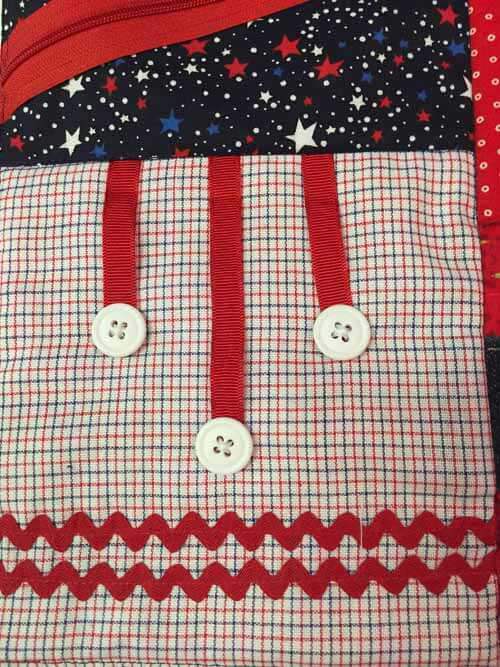 Sew two square together or cut a piece of fabric 5" x 9 1/2" to attach a longer zipper. Attach the zipper by sewing it flat. 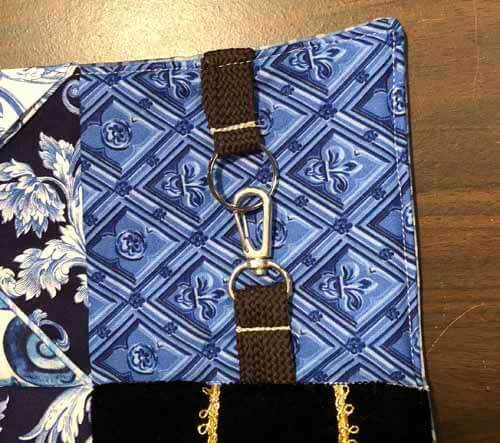 If zipper is not long enough to extend over the ends, put a folded piece of fabric the width of the square at the top and bottom edge and topstitch at the fold as shown in the picture above. 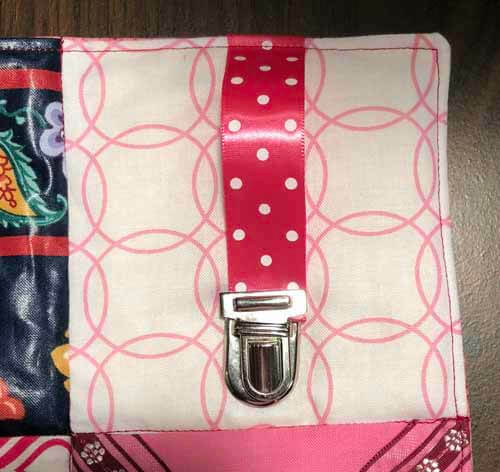 Sew the zipper between two fabrics and attach it to a fabric square or rectangle to create a zipper pocket. 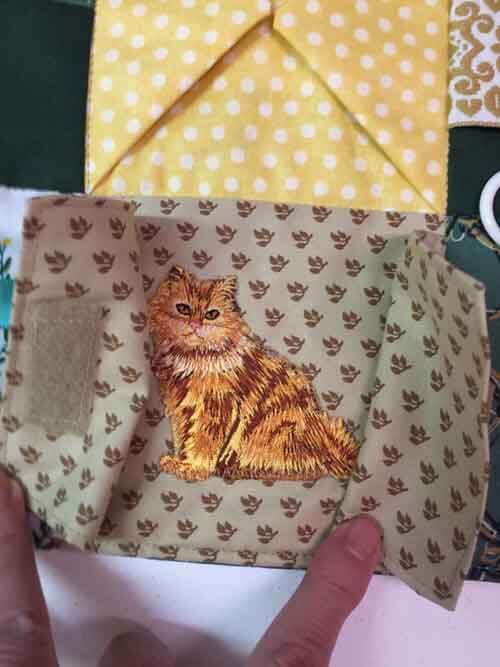 Fabric Pocket Square with Stuffed Surprise: To make stuffed mini pillow surprise, cut two pieces of fabric the same size. Pin a piece of ribbon to the raw edge, right side of one of the fabrics. Fold and pin the other end of the ribbon to the middle of the fabric so it will not get sewn into the seam allowance. Put the second fabric right side down on top. Sew around three sides, making sure to sew the side with the ribbon using a 1/4" seam allowance. Turn right side out, stuff, fold under opening and either hand or machine sew closed. To make pocket, place a 5" square on work surface. Take a second 5" square and fold in half with wrong sides together. Position this rectangular on top of the first 5" square. Align the rectangular piece along the bottom of the square, matching raw edges along bottom and sides. Sew in place. Pin end of stuffy's ribbon to the top of the 5" square so it will be sewn into the seam allowance when sewing the rows together. 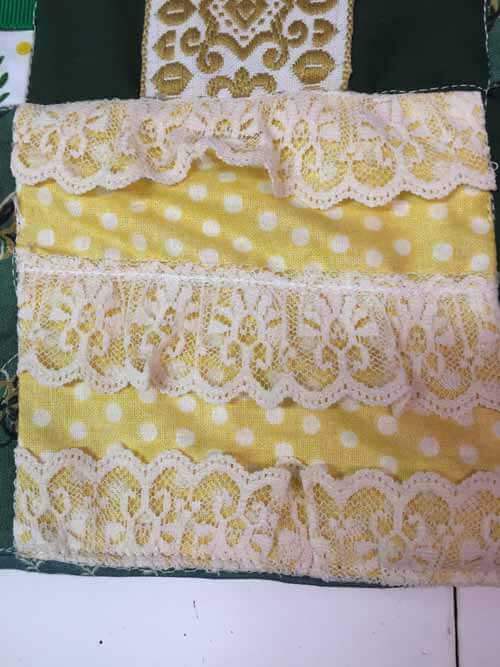 This is another example of fabric pocket with a stuffy. Prairie Points Square: Attach one or more prairie points to the square. 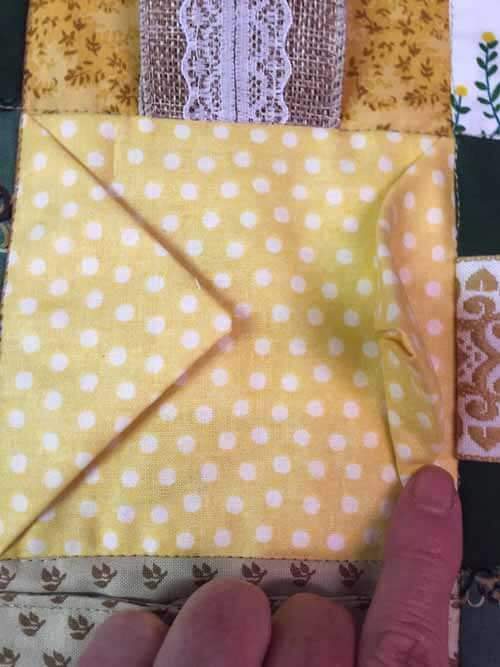 How to make prairie points - take a square piece of fabric, with wrong side of fabric facing up, fold the square in half. Bring the two folded corners down to equally meet in the middle. This forms a triangle. Attach raw edge of prairie point along raw edge of the square. Pin or sew in place. Bead Square: On a piece of cord, ribbon or shoelace string beads. Beads can be various sizes and shapes. 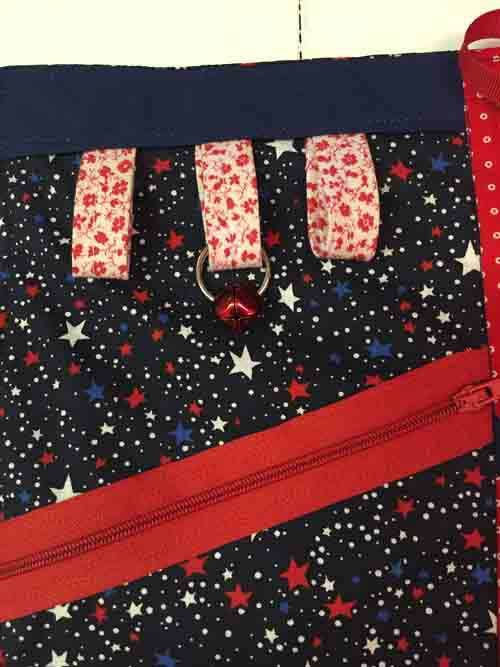 Securely attach the ends of the cord/ribbon/shoelace to the sew allowance. An empty thread spool can also be used instead of beads. Beads can be attached in different ways. This is another example of a bead square. Velcro Square: Use Velcro to attach something to the square. 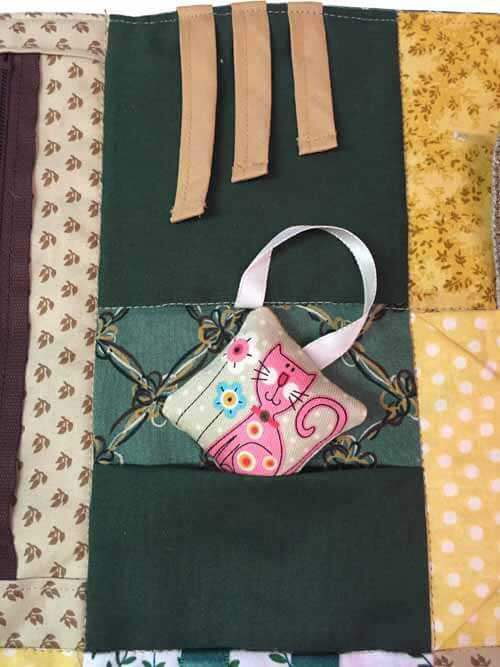 In this example, two pieces of fabric were sewn together with a ribbon and a Velcro strip. The other Velcro strip was attached to the square. The ribbon was sewn into the seam allowance. When using Velcro, make sure the pieces are securely attached to the square so they cannot get lost. 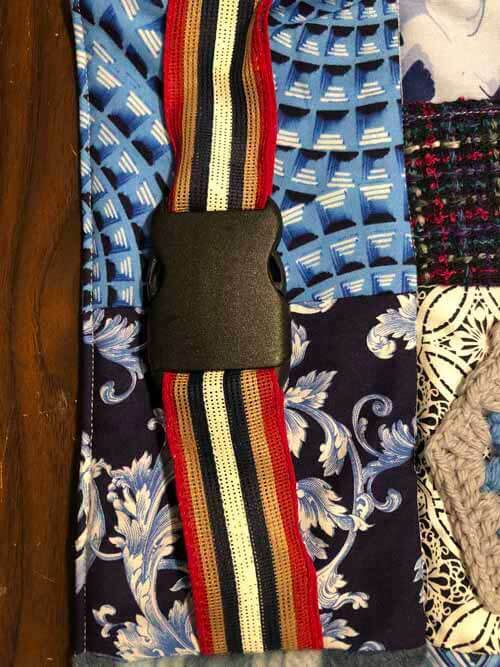 Belt and Buckle Squares: Attach belts, buckles or D-rings securely to the square with ribbon, fabric or cotton webbing. Choose large items which can be operated easily. Attach loosely to the square so the fasteners can be easily operated. 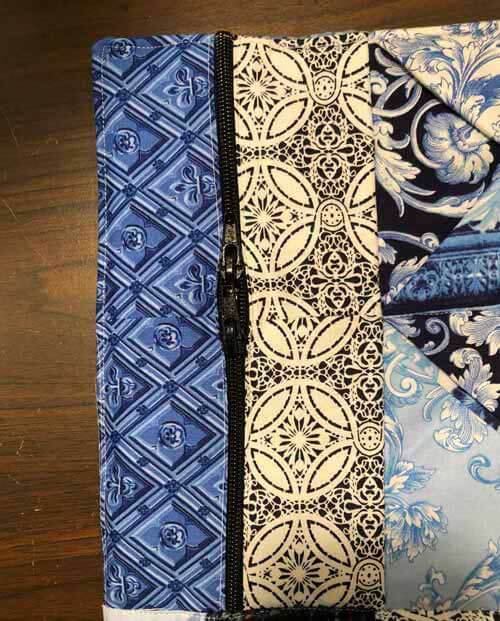 A few more examples of belt and buckle squares are above. Texture Squares: Make a square with some sort of textured fabric. Minky, denim, fleece, flannel, felt, fake fur, etc. are excellent choices. This is an example of a texture square. 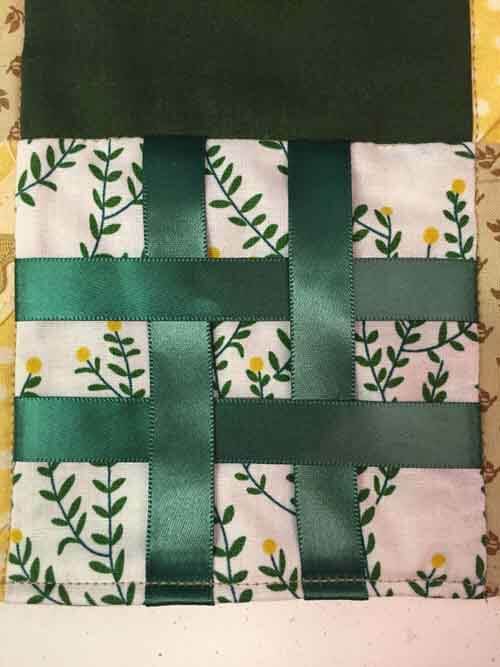 Lace, Rickrack, Ribbon and Button Squares: Attach lace, rickrack, ribbon and buttons to a square. Sew them flat, loop them or just attach in seam allowance so hands can go under them. Here are a few examples. 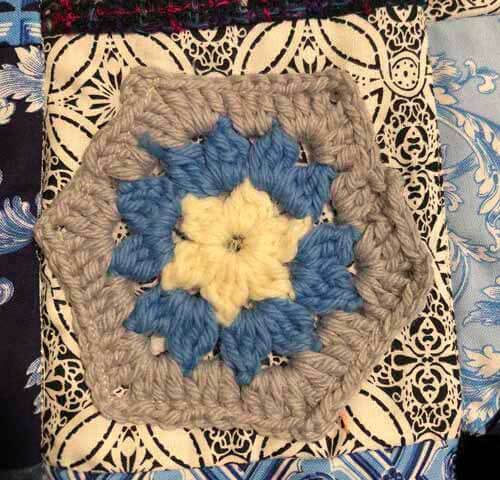 Decorative Squares: Small crochet motifs, fabric yo-yos, appliques and embroidered items can be attached to a square. Sewing machine decorative stitching can be stitched to a square. The possibilities are unless. 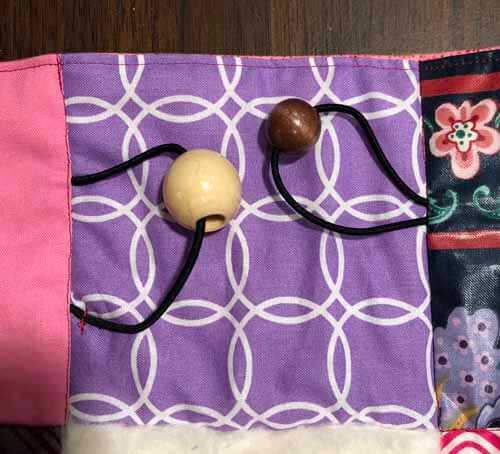 This fun square is made with fabric yo-yos and buttons. If using buttons make sure to attach them securely so the person cannot pull them off. 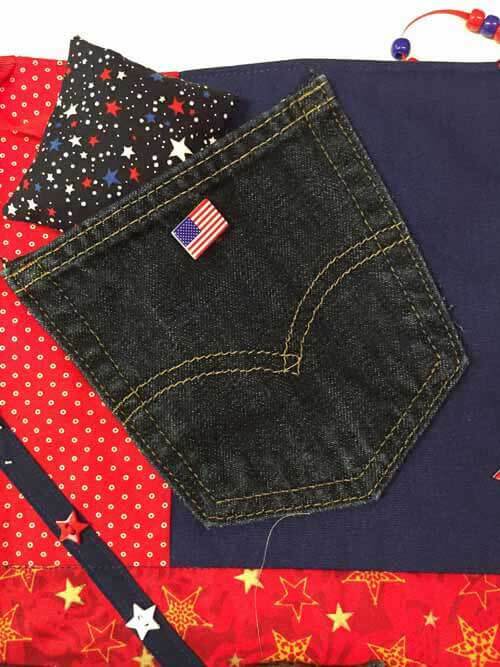 Recycle Jeans: Repurpose denim jeans by sewing the pocket and/or waistband to a fidget quilt. 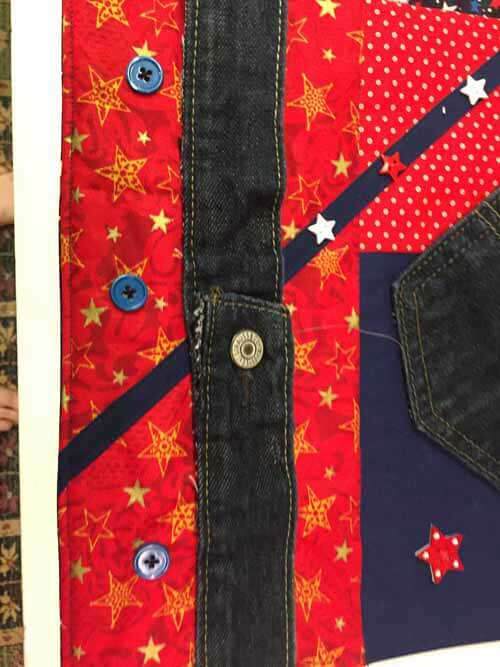 Also, you can use the denim as a texture element as part of the quilt top. A old jeans waistband was attached to a rectangular piece of fabric. It was attached loosely so the button could be opened and closed easily. Fidget Quilt Example #3 - For the above fidget quilt, various size squares and rectangles were cut to accommodate a top that would be approximately 18" x 20". Some with sewn together and then decorated. Others were decorated before being sewing together. 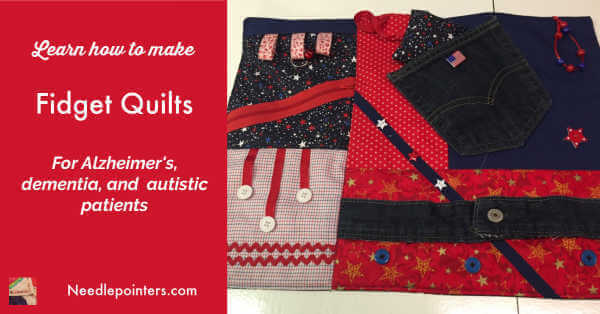 Find more inspiration on making fidget quilts by purchased the books at the end of this article. 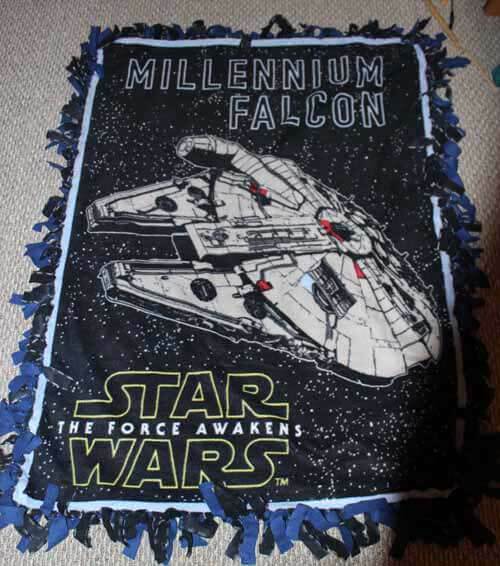 A tied fleece blanket is an excellent idea for a Alzheimer's, dementia, and autistic person. 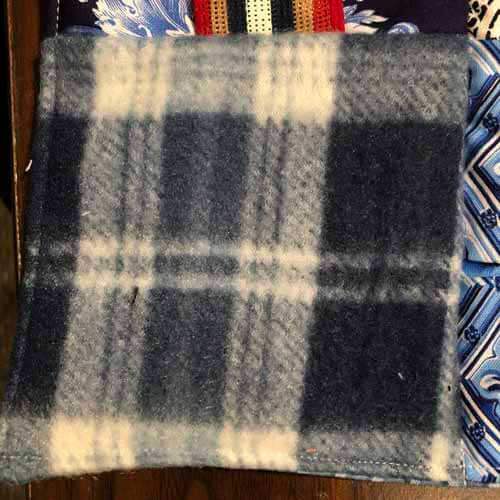 The soft and warmth of the fleece blanket will encourage senses with the texture and keep them warm.